On March 25 at a plenary session of the Iwate Prefectural Assembly, the ruling coalition including the Social Democratic Party and the Japanese Communist Party adopted by majority vote a written statement titled “Request that land reclamation work in Henoko cease, and that Okinawa Prefecture be negotiated with in good faith, based on the results of the Okinawa prefectural referendum.” The opposition Liberal Democratic Party and the neutral Komeito Party opposed the statement. 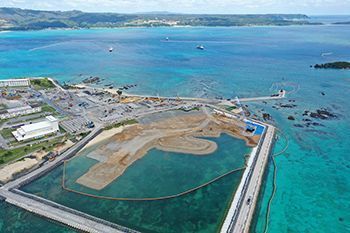 This appears to be the first time that a prefectural assembly of Japan, excepting the Okinawa Prefectural Assembly, has adopted a statement requesting that construction of the new base in Henoko be stopped. The statement points out that regarding land reclamation work in Henoko, “Due to the detection of matters including the existence of soft ground and an active fault line in the ocean area for land reclamation, the permit for land reclamation has been revoked, and the feasibility [of the land reclamation plan] is greatly shaken. According to the Iwate Prefectural Assembly office, citizens groups such as the Cooperative Center against Constitutional Revision submitted the statement to the office. The statement is addressed to the Prime Minister, the Minister for Foreign Affairs, and others. Iwate Governor Takuya Tasso spoke at a press conference on February 28 in regard to the next United States-South Korea Summit Conference. He stated his opinion that relocating Futenma Air Station to Henoko is not essential in terms of reducing tensions in East Asia. Concerning the results of the Okinawa prefectural referendum, Governor Tasso said, “It is my personal opinion that [the results] should be taken seriously. ” This is the first time the governor of a prefecture other than Okinawa has made reference to the Okinawa prefectural referendum results.